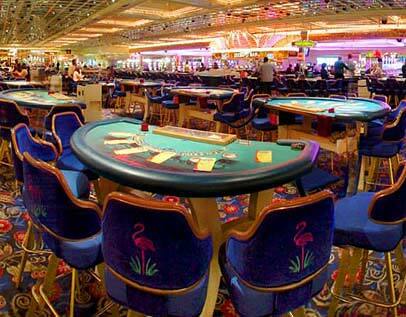 One of the best buffets in Las Vegas is located at the Flamingo; it's called the Paradise Garden Buffet. You will be so amazed with the beautifully view in the Wildlife Habitat, that you'll want to eat every meal there. It has huge glass windows over looking breath-taking waterfalls, palm trees and water lagoons with penguins and flamingos. Inside it has high ceilings, plants in every nook and cranny and a huge tree going in the middle of the restaurant. While taking in the scene you'll be able to enjoy fresh salads and fruits, savory cuts of steak, chicken and duck. Also, baked Atlantic salmon, pork chops, Maui onions and many selections of Seafood. They didn't forget about the sweat tooth either, there is a full dessert bar to finish off this delightful meal. If you're starting early, then this Las Vegas Buffet also offers a full breakfast menu. You'll be able to enjoy over 60 different breakfast selections from their Sunrise Brunch, many which are custom to order. The Flamingo Paradise Buffet is open between 7 AM to 10 PM. Breakfast, Brunch and Dinner hours vary. Type of Food: Buffet, Seafood, Beef, Turkey, and more. Price Range: $15 to $25 for dinner, $15 and below for breakfast and brunch. Specialty Dishes: Rib Eye steak, shrimp on ice, crab legs and slow roasted turkey.